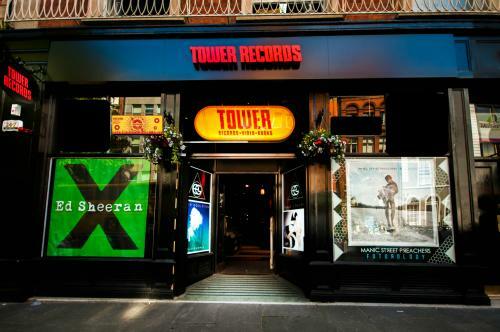 Tower Records is Ireland's largest Independent Record Stores. We have two stores in the heart of Dublin city. Our flagship store is No. 7 Dawson Street, Dublin 2 and our second store is in The Eason's Building, 40 lower O'Connell Street, Dublin 1. We specialise in music, film, hi-fi, merchandise and more. We are the proud stockists of Ireland's largest vinyl selections, with one in each branch. Our DVD and Blu ray sections stock a huge choice of film & TV and we are stockists of a massive selection of CD's across many genres, including the only extensive range of classical music in Ireland. We regularly host a number of live instore performances and signings from international and local artists. Previous visitors have included Bjork, Macklemore, Fall Out Boy, James Vincent McMorrow, Lisa Hannigan, Delorentos, Lykke Li, Frank Black, The Staves and Shane MacGowan to name a few. In our Dawson Street store we've got Tower Hifi. Our very own hi-fi store where we carry an impressive range of turntables, amps, CD players, speakers, headphones, multi-room sound systems and styli. We carry popular hi-fi brands such as Denon, Pioneer, Rega, Yamaha, Marantz, Q Acoustics and Pro-Ject. The only place you will ever need to go, to set up your own home sound system. ***Please note - there is a detailed rate card for windows & in-store POS which is available on request. ***Please submit link to band information music & release dates for singles, EP'S or albums when applying.